Dr. Park Kwang-Sur, president of Research Institute of Korean management Thoughts (KMT)speaks at the breakfast forum. “This is a man who can speak with few words, does what he thinks is right and says what he thinks,” said. Dr. Park Kwang-Sur, president of Research Institute of Korean management Thoughts (KMT) at the 1,725th breakfast forum at Lotte Hotel on Jan. 26, 2012. Dr. Park was referring to 92-year-old Kim Ki-Un, the founder and chairman of Baekje Pharmaceutical Company, South Korea's pharmaceutical giant. Chairman Kim is received as a legendary figure, who has built a pharmaceutical empire with his bare hand in this industrial sector. Dr. Park's lecture on Chairman Kim went on about an hour and a half. 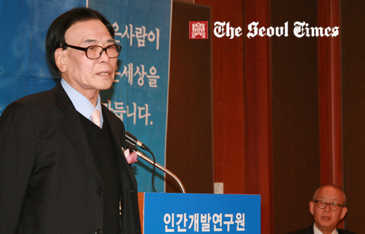 Dr. Park said that Kim was born 92 years ago in Muan, South Jeolla Province. He was raised in a very poor family and was barely able to finish his elementary school. Nowadays he is the oldest CEO, a very successful businessman and founder of Baekje pharmacies. After graduating his elementary school, he moved to the Mokpo area to work in a drugstore. This is where his successful life started. He worked in the drugstore from 6’o clock in the morning until10’ o’clock in the evening without complaining. Because he was such a hard working man he got a more important position, which was taking care of the money. He got the opportunity to study at a Japanese school to get his pharmacists license. There were 150 applicants and only three would pass. Unfortunately Mr. Kim was not one of the lucky ones this age of not even 20. From that time things weren’t looking very bright anymore for . Kim, he was prognose with pneumonia and was treated in the hospital for two months, he was advised to leave the city and go back to his hometown to rest where he stayed for two years to fully recover. A normal person would die from pneumonia but Kim was strong and completely recovered. 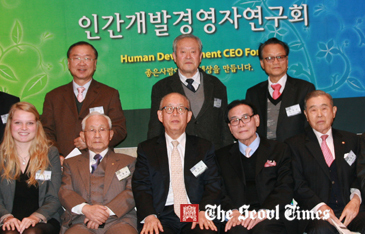 Chairman Chang Man-Key (center seated) of the Korean Human Development Institute (KHDI), organizer of the forum, poses with Dr. Park Kwang-Sur (to his right), president of Research Institute of Korean management Thoughts (KMT), and other participants. One year later he opened his own small drugstore called BAEKJE in Mokpo. This little drugstore was a huge success and with this company he made a lot of money. He brought his parents to the city to live with him and he gave them money to live a normal life from. “Living happily with my family and making compromises is the most important thing for me” Mr. Kim was quoted as saying. In 1950 North Korea invades South Korea, which means the start of the Korean War (1950-53). A lot of people had to flee the country and Mr. Kim was one of them. Until the War ended in 1953 he wasn’t able to do anything and had to start all over again. When the war was over he started a liquor company which was a failure. This time he knew he had to get back to where he was good at, the pharmaceutical industry. He restarted his drugstore and became a wholesaler in the Jeolla district. He came all the way up to Seoul and noticed that the other pharmaceutical companies there started to recognize him. And within two years he was back in business and better than ever. He decided that besides his pharmaceutical side he also wanted to do something socially correct and help the environment. He started planting trees. His forestry called Chodan contains more than 5 million big trees, in which he invested over more than billions of won. “Mr. Kim is very concerned about the trees; he even keeps a journal about them. The future generation will be finitely benefit from this project” Dr. Park said. But, with only holding trees Mr. Kim was not satisfied. In his hometown Muan he founded the Baekje Girls Commercial High School for the poor working young ladies. Again it had gotten very successful and immediately there were hundreds of applicants. Also he supported the National Women’s Handball Team. Like everything he touches changes in gold, this did too. In1988 the National Women’s Handball Team won gold on the Seoul Olympics. Later he found the Chodan University which he placed next to the Girls Commercial High School, with a lot of state of the art facilities and surrounded by a beautiful landscape. On his age he still visits the school sand his trees every month. He enjoys seeing these successful projects which he has started to make people happy and give them a better start that he ever had. “Before I die I want to repay all the debts that people gave meant I want to share everything that I have with other people. Looking at my age I have not planned any other projects,” Mr. Kim was quoted as saying. Joline van Gelder serves as Dutch Correspondent for The Seoul Times. She studied International Communication and Media at Utrecht University of Applied Science in the Netherlands. She also studied at University Antonio de Nebrija in Madrid, Spain. During her high school years she spent a year at East Jefferson High School in New Orleans in the US.